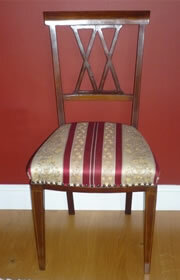 We have 5 of these chairs and are looking for up to 3 more but happy to buy singly. They have carving on the tops and legs. I am looking for 4 walnut dining chairs very similar to some that I saw online but somebody beat me to it. 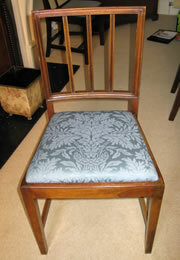 Wanted: Oak with veneered back. We have four of these and would like to find more, or more that would be compatible. They are solid and heavy in oak with a quartered oak veneer on the black splat. 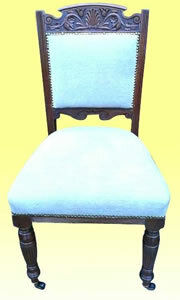 Searching for a pair of chairs to make up a set of ten for a client. 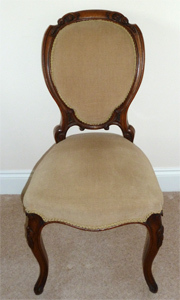 A very good set of 8 Regency mahogany dining chairs, 2 carvers and 6 singles with carved bar backs drop in seats and sabre front legs. 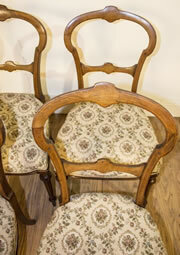 This set of chairs are all in very good original condition. 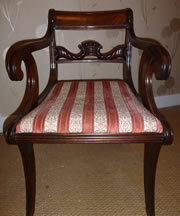 I am looking for matching Mahogany Regency Dining chairs and carvers to those pictured. Ideally I would like at least 5 Chairs and 1 Carver but would consider any number. 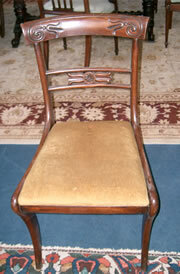 A very good quality set of 8 matching Victorian golden mahogany chairs with stuffover seats and turned legs, these are a very sturdy set of chairs.